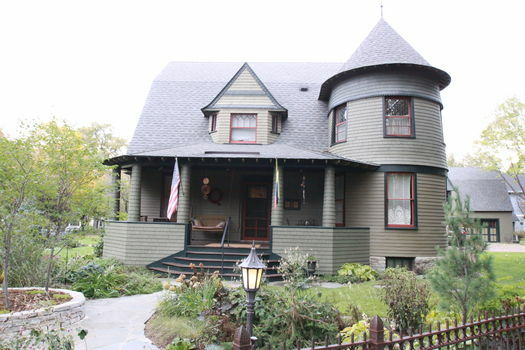 The McCourt House is one of Gilbert & Taylor's finest urban Shingle-Style residences. Although modest in size, the house has a well-integrated design and successfully occupies a site where all the facades are highly visible. The exterior displays a skillful juxtaposition of volumes and voids including a circular tower that intersects the porch roof. The chimneypiece is exposed on the exterior for volumetric effect. Porch posts are round and shingled in a rather personal adaptation of the Shingle Style. Window design provides one of the most individual stylistic themes in the firm's residential architecture. In the McCourt House, an interlocking pattern of ovals in the leaded-glass windows could be mistaken for a modern treatment. 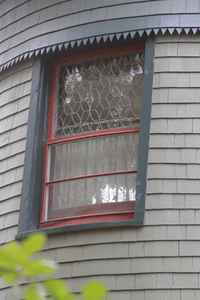 The stairway window is influenced by the Queen Anne style, and the wood muntins divide a double border of small rectangular panes on the perimeter, while the center is filled with a radial pattern of curving muntins. David McCourt was a dentist who paid $3000 for his house and likely ran into financial difficulties. In 1891, he owed money to Gilbert & Taylor. [James K. Taylor to CG, June 4,1891, Box 17, Fldr. : General Correspondence, 1891, MNHS-CGP] He sold his house to G.O. Somers and moved a few doors down on Princeton Avenue. In 1897, Somers hired Gilbert to design the barn/stable. 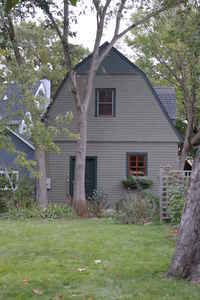 The gambrel roof harmonizes with the roof of the house, and there is a projected gable above the hayloft door. 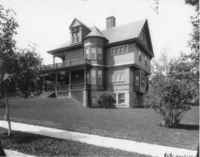 The McCourt House was one of the first to be built in Macalester Park, which was laid out as a romantic suburb with winding streets. The new street railway system made Macalester Park easily accessible to downtown Saint Paul.